Each one of these couplets has a goal of 4 rounds or more in a 3 min window. 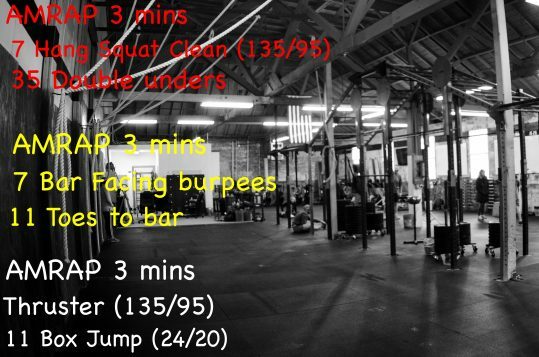 Going to have to keep a strong pace and the loading on the barbell should be something that allows you to do the set unbroken for at least the first 2-3 rounds. Adjust as needed in order to do so. On the second AMRAP if you need to break the T2B up early on to keep moving do so. This could save your grip a bit and avoid fatigue for the later rounds. Each AMRAP has a 1 min rest between rounds so trust in your fitness and recovery. Work to keep the reps the same but modify the loading on the barbell if needed in order to meet the goal rounds for each one of the couplets. Hang on for that last AMRAP and fight to get that 4 rounds or close to it.